For other uses, see Veracruz (disambiguation). ^ a. The state's GDP was 381,761,202 thousand of pesos in 2008, amount corresponding to 29,825,093.9 thousand dollars, with a dollar worth 12.80 pesos (value of June 3, 2010). Veracruz (American Spanish: [beɾaˈkɾus] ( listen)), formally Veracruz de Ignacio de la Llave (American Spanish: [beɾaˈkɾuz ðe iɣˈnasjo ðe la ˈʝaβe]), officially the Free and Sovereign State of Veracruz de Ignacio de la Llave (Spanish: Estado Libre y Soberano de Veracruz de Ignacio de la Llave), is one of the 31 states that, along with the Federal District, comprise the 32 federative entities of Mexico. It is divided in 212 municipalities and its capital city is Xalapa-Enríquez. 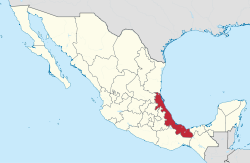 Veracruz is bordered by the states of Tamaulipas to the north, San Luis Potosí and Hidalgo to the west, Puebla to the southwest, Oaxaca and Chiapas to the south, and Tabasco to the southeast. On its east, Veracruz has a significant share of the coastline of the Gulf of Mexico. In addition to the capital city, the state's largest cities include Veracruz, Coatzacoalcos, Córdoba, Minatitlán, Poza Rica, Boca Del Río and Orizaba. ✪ What happened to VERACRUZ, MEXICO?!? ✪ Puerto de Veracruz 2019 ¿Que hacer, que ver, a donde ir? Hello Tangerineys! From Heroica Veracruz (Puerto de Veracruz). Close to the capital of the state of Veracruz. It's our first time in this state. I did not realize how much of this state borders the Gulf of Mexico, it has a huge part of that! Yeah, it's like a sibling who is like mine, it's mine, it's all mine! The Gulf of Mexico, it's mine! We are going to be here for exactly one week. We're staying in the very desirable Boca del Rio area. Or well, a little bit north of that, so slightly less desirable in that area. [Laughter] But we're gonna make the best of it. We are currently standing in front of this lovely beach in the Heroica Veracruz. Main Centro historic area. Sorry. We've spent about this past six weeks at about 6,000 feet above sea level, and now we are approximately six inches above sea level. Yes! [Laughter] But not for long! Oh yeah, you'll you'll find out though. We'll tell you, coming up! It is around 80 degrees, lots of humidity as one would expect being next to the ocean. So it's a nice change of pace from being up in the cold mountains! Certainly a lot breezier! This is, you know, get ready for some of this! Your hair is already curly. [Laughter] We're walking the malecon here, So we have like this great view out to the ocean! We keep trying to get these on camera but it's as if they know that they're being recorded and they go into hiding. But there's all these crabs on all these rocks! I've never seen so many in my life! Real crabs. And they're big crabs! They're really big, yeah! This malecon is nice! It's a Friday but there's no one out here. We have it all to ourselves, and it's this big wide area! Yeah, come to think of it, I don't think I've ever been to a beach city Anywhere with such few people! There's hardly anyone anywhere. [Laughter] Mm-hmm. Yeah, there's just a couple vendors. There were a couple vendors selling coconuts. Some guy just tried to sell us something, I didn't know what it was. Out of a, by the way, stroller. [Laughter] Out of a stroller, yes. Oh, it's just a stick. Oh, there's another crab! So it was getting pretty hot outside just to be walking around in the sun! So we decided to come in this mall that was nearby. Which has air conditioning. Now, as you can probably see behind us, we are at a movie theater. Cinepolis. We haven't been to one in a while! But we really loved doing this when we were living in Guadalajara! Tickets were 52 pesos a person. At this theater, we were pretty surprised that there were plenty of showtimes in English. And with subtitles, Spanish subtitles. When we were in Puebla city, there were hardly any theaters at all that had English showtimes. Yeah, and if you're looking for a movie in English you want to see - on the screen, it will say "SUB" That's short for "Subtitled" in Spanish. Sub-dilly-ada as Jordan likes to say. [Laughter] We're in an Heroica Veracruz right now. And this is pretty close to the Centro, but it's right next to the very popular aquarium, which we'll be going to right after this. And where did we just book? We just booked a place, I'm so excited! For a week, In San Cristobal de Las Casas. And that is in the state of Chiapas. It'll be our first time there! And it's highly, highly, highly recommended! So yesterday we were kind of thinking that Veracruz, at least the beaches, well actually a lot of places. Were somewhat abandoned or maybe they used to be touristy but there's nothing really here. This beach, on the other hand, this is where people come to swim and hang out! And there's all the vendors you could ever desire. [Laughter] With clothes, and swimsuits, and things eat, and people trying to get you to eat at their restaurant. So I think we should - it would have been better if we stayed in this side of town. Most people on the beach here though, use water shoes, because we have seen glass. Yeah, broken glass everywhere! And there's lots of shells. That would not feel good! Being in Girl Scouts for over 13 years, taught me a lot of very valuable life lessons. Two of which are "Leave No Trace" and "Leave a place better than when you found it." So although we're not contributing to this glass being on the beach. If we're walking by and we see it, we're gonna pick it up, and put it in a bag, and throw it away. Yeah, before coming to Mexico, I spent a ton of time on Facebook groups. And one time I read the story of this lady who moved to a beach town, and she loved it! But the only thing she didn't like was that there was always a bunch of trash on the beach. So every morning when she went for a walk, she would take a trash bag with her and pick up all the trash along the way. And at first, people looked at her like she was weird. But even just after a few days, Other people were doing it too. And within a couple weeks, the beach was totally clean! What difference one person can make! So we are heading to the aquarium now. It costs a 135 pesos. So let's see what one of the biggest attractions in Veracruz is like! What is that? It's a water dog! [Laughter] Awe! So cute! Well so far in this aquarium, I think these animals, or these fish, have very large spaces! Like this, we're totally surrounded by this. And it's all one huge tank! It's crazy! It is crazy how scary these fish are! How huge they are! I didn't even know like regular fish could have such mass! They probably weigh more than I do! [Laughter] Sharks, I knew. But these type of fish, woah! Regular fish. Regular, "regular." You know what I mean? Like the ones that look like fish. [Laughter] Look at this guy! So we're looking at the dolphins now. This is the outdoor part of this aquarium, and they're doing a bunch of tricks. And I think the dolphin stuff is cool, but then hearing the kids go "ooo! ahh!" It's really adorable! [Kids cheering] You can go over here and look up to the ocean! It's a cool experience, if you're here, you might as well check it out! If you're in Veracruz, this is something I'd recommend doing once. I don't feel the need to do it again. And right around the beach that's next to the aquarium there's lots of vendors, There's lots of people set up with a restaurant serving drinks and food. On our way by, we Saw a piña colada served in a pineapple! So I kind of have to go get one of those! I've never had a drink out of a pineapple! Me either. Thanks for watching our video up to this point now! We're not quite done yet, but if you haven't already, please subscribe to our Channel! What do we got here? Our first drink in a pineapple! It's a piña colada, in a piña! 250 pesos. Not the cheapest drink ever but we're sharing it. There's some beach experiences that are just too hard to pass up, and this was one of them. [Laughter] So while sitting here drinking our drink out of a pineapple, Maddie got elote for 15 pesos. I said that so weird. 15 pesos. haHA! And I got three chili rellenos tacos for 50 pesos. So right now we are walking around our neighborhood, taking this hyper-energetic lady for a walk. And to go to the beach. Ah, this is kind of scary! [Dogs barking] On this street, there's a lot of cables and stuff. Can you please help me? Oh geez! No! Anyway. Ah! Oh my gosh! I'm trying to show you Laska while telling you this. You guys always want to see her! [Laughter] The Airbnb we're staying at is really nice (the inside, at least.) In this area. And it's only a block away from the beach! And there we have it! Right in front of us is the ocean! Laska, is that a bird? [Laughter] Right now, we're at this breakfast restaurant in Boca del Rio. This is right on the end of the Boca del Rio malecon, with a great view out to the sea! I got a shrimp omelette for 80 pesos. Maddie got huevos al gusto for 65 pesos. And this is the best deal we've found in the whole city. We've found the city to be quite expensive, especially considering there's not really any tourism here. Maybe it's kind of similar to Monterrey in that there's like a lot of industry there and the prices are pretty high. Well here, this is a big port city. What do you think? Yeah, I don't get why the prices are so high. But they are. And we're not, obviously. There's like seafood stuff, Jordan got a shrimp omelette. We're not talking about seafood because obviously that's going to be more expensive no matter where you go. But just your average things like huevos al gusto, or coffee, or I don't know, prices at OXXO even? They're all higher. So it's super weird considering there's like no foreigners here. There's not like beach resorts That are drawing a lot of people that are spending money and all that. So it seems pretty strange to me. But for the most part, it seems to be rundown in a lot of places. There aren't a lot of parts of the city that are really...revitalized. Yeah. Revitalized. It's almost like it used to be a thriving city, And then something happened. We don't know what. But, just the money dried up. Tourism dried up. Everything dried up. And therefore things are just deteriorating over time. Yeah, we don't know what the story is. If you know, please fill us in. But we're going to enjoy our breakfast and this gorgeous view! Oh, by the way. My picada. Picada, is it? I think it's Picada. Picada. It's missing sauce because that had onion, so they made it with just tomato on the base. But this is like Veracruz's version of a sope, I think? Maybe it's the same thing with just a regionally different name. I guess that's one way to eat it. How are you supposed to eat it? I don't know, With a fork and a knife? We're trying to try as much food like that as possible I also tried consomé. Which is like soup. That that was super good! as well. Super-good? (word play) Souper good! [Laughter] So, whenever we go to a new city, and whatever video we make. We want you guys to know that we're the channel that tells it like it is. We tell you the honest stuff, the real stuff, because that's life, and that's reality. And we're not going to tell you all the rosy stuff. All the rainbows and sunshine. Well, we are going to tell you that, but not just that [Laughter] But we deal with a dilemma we go to a city that we aren't super fond of, because we don't want to offend people who live here, and this is their city that they love so much, and they just want to show it to the world because they're proud of it. But we also don't want to lie and say like "This is the greatest city ever!" When it's not (in our opinion.) Oh, oh, oh! A full sand dollar! We're rich! There's broken ones all over the beach but we finally found a whole one! So what are your thoughts? You know what, I don't know what to think of it. I feel like something happened with the city. There might have been a thriving tourism industry in the past. But now, today, there's lots of buildings that used to look really nice that are completely abandoned. Or buildings that were like high-rises or hotels that were started but then they didn't finish it. Uh-huh. And we saw the port yesterday, and the port is still clearly thriving! There's tons of ships out here. There's ships that wait out here and they have to wait for their turn in the port? I'm not sure how that works. But it seems like they're waiting for days. But yeah, there is still quite a bit of money here. It's an expensive city. Oh, oh, oh! We're double rich! So we say this - We're shocked! We get so shocked when we go to new city! There really are things that shock us. But here, I wasn't expecting this city. A lot of aspects about Veracruz, we weren't expecting any of that! And I'm not expecting this wave to get me. No! Veracruz brings back some really good memories for me, because there's crabs all over the place! Back when I was younger, my family went on this vacation in Florida, and I had to get a crab net and a crab bucket! And I spent pretty much the entire vacation on the beach catching crabs. I taught Maddie this game last night. Except no net and no crab bucket. So we didn't catch anything. We were just chasing them into their holes. [Laughter] And Laska, when she saw the crabs, she was freaking out! She had to have the crabs! Now we're walking on the Boca Del Rio malecon, and we were told that this is the nicer part of town. There's a mall on the far side of the river. The malecon itself is really really nice! It's still, for like - for this being the nicer side of town. There are nicer buildings but you still have those abandoned spots mixed in. Like pretty much every place could use a fresh coat of paint, that kind of thing. Lots of places for rent and sale! Yes! Tons! Tons of places for rent and sale. It's just, I'm just thoroughly baffled by this city! There are tons of other places in Veracruz that we would really love to see! Like Pueblos Mágicos that we didn't get to go to. We did stop by, what was it called? Orizaba? Orizaba? Orizaba. On the way here, but Laska was in the car. We had all our stuff. So We couldn't really like take a look around or anything. But there's plenty of other places that I would be delighted to explore! But, I don't know, this city... Would you come back? I mean, there's so many places in Mexico that I want to see! If I did, it'd probably be a while. But Veracruz, the state of Veracruz has a ton of shoreline along the Gulf of Mexico! So much! I'm sure there's tons of great beaches here, in this state! So the more we drive and walk around the city, the more I'm questioning if there's something that happened with the real estate market, both commercial and residential. We're seeing tons of "for rent" "for sale" signs on buildings! A bunch of abandoned construction projects - like buildings they built halfway and appeared to have stopped working on all together. I know that's not uncommon, in Mexico, for that to happen. Because there's usually limited financing and it's all financed with cash. But, there is a ton of it going on here! So my guess is, there was pretty recently a real estate crash here, and they're just starting to recover from it. But I don't know, I can only find out so much in just a few days. And this is without talking to anyone. These are just personal observations. So can you give the folks at home your final thoughts on Veracruz? Okay, so this might not be our favorite city ever in the world. But what I can say is that the people here, everyone that we've been interacted with, are super nice, polite, helpful, pleasant. I was sort of expecting this to be a super dangerous or like questionably safe state. Because that's what we've been told in comments and like about driving and stuff like that. So, as far as safety, despite us staying in a very sketchy neighborhood. [Laughter] That outward appearances would give us the indication that it's not the safest. I've never actually felt in danger. I don't think there's a lot to worry about, and that could be because there's just not a lot of people in the city. You say there's not a lot of people in the city, there's not a lot of people walking around. I mean, it's a very populated city, how can that be? Yeah, tell me! Help! How? I don't know. But do you agree? Do you think? I think there's plenty of traffic. But, there were some parts. Like walking down the Veracruz malecon. Passing by almost nobody. That was - that was kind of weird having the Malecon all to ourselves on a Friday. Just one more thing I don't quite understand about the city. How about prices? We didn't really explain that. Going from like a scale of one, for the cheapest place we've stayed in Mexico, and ten for the most expensive. Being Play Del Carmen, just to clarify. Yeah. I'd probably say this is around an 8, 8.5, 9. Your average cup of coffee in other cities it might be around 20 pesos. Here, you're probably looking at thirty or thirty five pesos. It just. I mean, I think it's almost sad that this used to be Probably a really popular destination. And now it's like where'd everyone go? What happened? The buildings are crumbling. Like what happened here? If you haven't already, please subscribe to our Channel. Up next, we are going to San Cristobal de Las Casas. In the mountains! I'm so excited to go to this Pueblo Mágico! If you enjoyed this, please share it with a friend! And one more thing. GONG THAT BELL! So you get notified the next time we put out a new video! And we'll see you in Chiapas! In Chiapas! The full name of the state is Veracruz de Ignacio de la Llave. Veracruz was named after the city of Veracruz (From Latin Vera Crux, "True Cross"), which was originally called the Villa Rica de la Vera Cruz. The suffix is in honor of Ignacio de la Llave y Segura Zevallos (1818–1863), who was the governor of Veracruz from 1861 to 1862. The state's seal was authorized by the state legislature in 1954, adapting the one used for the port of Veracruz and created by the Spanish in the early 16th century. The state is a crescent-shaped strip of land wedged between the Sierra Madre Oriental to the west and the Gulf of Mexico to the east. Its total area is 78,815 km2 (30,431 sq mi), accounting for about 3.7% of Mexico's total territory. It stretches about 650 km (403.9 mi) north to south, but its width varies from between 212 km (132 mi) to 36 km (22 mi), with an average of about 100 km (62 mi) in width. Veracruz shares common borders with the states of Tamaulipas (to the north), Oaxaca and Chiapas (to the south), Tabasco (to the southeast), and Puebla, Hidalgo, and San Luis Potosí (on the west). Veracruz has 690 km (429 mi) of coastline with the Gulf of Mexico. The natural geography can be categoried into nine regions: The Sierra de Zongolica, the Tecolutla Region, the Huayacocotla Region, the Metlac River area, the Tuxtlas Region, the Central Region, the Laguna del Castillo Region, the Pueblo Viejo-Tamiahua Region and the Laguna de Alvarado Region. The topography changes drastically, rising from the narrow coastal plains to the highlands of the eastern Sierra Madre. Elevation varies from sea level to the Pico de Orizaba, Mexico's highest peak at 5,636 m (18,491 ft) above sea level. The coast consists of low sandy strips interspersed with tidewater streams and lagoons. Most of the long coastline is narrow and sandy with unstable dunes, small shifting lagoons and points. The mountains are of the Sierra Madre Oriental and the Trans-Mexican Volcanic Belt. Mountain ranges include the Sierra de Topila, Sierra de Otontepec, Sierra de Huayacocotla, Sierra de Coxquihui, Sierra de Chiconquiaco, Sierra de Jalacingo, Sierra de Axocuapan, Sierra de Huatusco, Sierra de Zongolica and the Sierra de Los Tuxtla. Major peaks include Pico de Orizaba (5,636 m, 18,491 ft), Cofre de Perote (4,282 m, 14,048.6 ft), Cerro de Tecomates (3,227 m, 10,587 ft), Cerro del Vigía Alta (3,055 m, 10,023 ft) and Cerro de 3 Tortas (2,997 m, 9,833 ft). The Pico de Orizaba is covered in snow year round; the Cofre de Perote is covered in winter. Major valleys include the Acultzingo, Córdoba, Maltrata, Orizaba and San Andrés. More than 40 rivers and tributaries provide water for irrigation and hydroelectric power; they also carry rich silt down from the eroding highlands, which is deposited in the valleys and coastal areas. All of the rivers and streams that cross the state begin in the Sierra Madre Oriental or in the Central Mesa, flowing east to the Gulf of Mexico. The important ones include: Actopan River, Acuatempan river, Río Blanco, Cazones River, Coatzacoalcos River, Río de La Antigua, Hueyapan River, Jamapa River, Nautla River, Pánuco River, Papaloapan River, Tecolutla River, Tonalá River, Tuxpan River and Xoloapa River. The largest in terms of water discharge are the Pánuco, Tuxpan, Papaloapan, Coazocoalcos and Uxpanapa. The Panuco, Tuxpan, Papaloapan and Coatzacoalcos are navigable. Two of Mexico's most polluted rivers, the Coatzacoalcos and the Río Blanco are located in the state. Much of the pollution comes from industrial sources, but the discharge of sewerage and uncontrolled garbage disposal are also major contributors. The state has very few sewage treatment plants, with only 10% of sewage being treated before discharge. The state also has ten major waterfalls and ten major coastal lagoons. There is only one significant lake, called Lake Catemaco. Off the coast are the islands of Isla de Lobos, Isla de los Burros, Isla de Sacrificios, Isla de Salmendina, Isla del Idolo, Isladel Toro, Isla Frijoles, Isla Juan A Ramirez, Isla Pajaros and Isla Terrón and the ocean reefs called Blanquilla, Medio, Tangüillo, Tuxpan, Gualleguilla, Gallega, Anegada de Adento Anegada de Afuera and Cabezo. The large variation of altitude results in a large mixture of climates, from cold, snow-topped mountain peaks to warm wet tropical areas on the coast. 32% of the state is classified as hot and humid, 52% as hot and semi humid, 9% is warm and humid, 6% as temperate and humid and 1% is classified as cold. Hot and humid and hot and semi-humid climates dominate from sea level to about 1,000 m (3,280.8 ft) above sea level. Average annual temperature ranges from 22 to 26C with precipitation varying from 2,000 mm (78.7 in) to just over 3,500 mm (137.8 in) per year. Cooler and humid climates are found at elevations between 1,000 m (3,280.8 ft) and 1,600 m (5,249.3 ft). These have an average temperature of between 18 and 22C with precipitation varying between 2,000 mm (78.7 in) and 2,500 mm (98.4 in). Temperate climates are found at higher altitudes, between 1,600 m (5,249.3 ft) and 2,800 m (9,186.4 ft). Temperatures here vary from 12 to 18C with precipitation varying more, between 500 mm (19.7 in) and 2,500 mm (98.4 in). Cold climates are found at the highest elevations, reaching up to the Cofre de Perote and the Pico de Orizaba. There is a small semi arid region around the city of Perote and the west of the Huasteca area. This is due to a rain shadow caused by the Trans-Mexican Volcanic Belt and the Sierra Madre Oriental, which do not permit the flow of moist Gulf air to this region. Various types of forest cover the state, but evergreen tropical forest dominate. The state's ecoregion is of great importance for many plant and animal species. It is a center of plant endemism and has two separate endemic bird areas. The northern part of the state as well as the higher mountain areas, are convergence zones between lowland evergreen tropical forests and more temperate flora and fauna. It is also the northernmost occurrence of subhumid tropical forest in Mexico, although little of this remains, mostly on steep slopes. This tropical forest is situated in the northeastern coastal plain and extends into southern Tamaulipas state, on the east side of the Sierra Madre Oriental. The soils here are volcanic and shallow, but with rich organic matter. Species that predominate include Mayan breadnut (Brosimum alicastrum), sapodilla (Manilkara zapota), rosadillo (Celtis monoica), Bursera simaruba, Dendropanax arboreus, and Sideroxylon capiri. This ecoregion extends into the central part of the state, with vegetation changing to include mahogany (Swietenia macrophylla), sapodilla (Manilkara zapota), Bernoullia flammea, and Astronium graveolens . Veracruz has been described as having one of the richest varieties of wildlife in the western hemisphere. There is an especially diverse array of endemic insects like the conspicuous Arsenura armida. As well as insects, the state is known for its many arachnids, and features over 25 species of tarantula (Theraphosidae), of which many are endemic. The state is part of Birdlife International’s Endemic Bird Area(EBA) project due to the number of endemic birds here. Some of these include green-cheeked amazon (Amazona viridigenalis), Tamaulipas crow (Corvus imparatus), Altamira yellowthroat (Geothlypis flavovelata) and crimson-collared grosbeak (Rhodothraupis celaeno). Despite much of the deterioration of the forest areas, it is still an important stopover for migratory birds as well. Many endangered mammal species can be found here including two endemic rodents (Peromyscus ochraventer, Neotoma angustapalata), the jaguar (Panthera onca), ocelot (Leopardus pardalis), jaguarundi (Herpailurus yaguarondi) and coati (Nasua narica) . The endangered Baird's tapir may occasionally be spotted in the state's southern jungle regions, such as Biósfera Los Tuxtlas. This region is also the northernmost extent of the primate Alouatta palliata, or mantled howler. Most of Veracruz's native forests have been destroyed and replaced by scrub and secondary communities of trees. From 1900 to 1987, over 18,553 km2 (7,163.4 sq mi) of forest had been logged, resulting in the loss of habitat and biodiversity. Much of the logging is due to commercial timber, search for tropical hardwoods and the clearing of land for local farmers, especially for cattle grazing. Only 20% of Veracruz's original ecosystem remains, with 64% transformed by human exploitation. Despite some efforts at conservation and reclamation, exploitation continues to put pressure on remaining wild areas. The state has 31 environmentally protected areas in 21 different municipalities. Nine are urban parks, three are national parks (Pico de Orizaba, Cofre de Perote and San José de los Molinos . The Cofre de Perote National Park is 11,700 hectares of pine and oyamel forest, which was created in 1937. The Los Tuxtlas Biosphere Reserve covers the municipalities of Ángel R. Cabada, Santiago Tuxtla, San Andres Tuxtla, Catemaco, Soteapan, Mecayapan, Pajapan and Tatahuicapan for a total of 155,122 ha (383,314.8 acres). It contains various volcanos such as San Martín and Santa Marta and rich biodiversity as it stretches from sea level to higher elevations, with 16 climate regions groups into four climate types. Forest types range from evergreen tropical rainforest to pine. 75% of species here are also found in Central America and there is a total of 2,368 plant species. Some, such as Costus dirzoi, Daphnopsis megacarpa, Eugenia sotoesparzae, Inga sinacae, Miconia ibarrae, Mormodes tuxtlensis and Thelypteris rachyflexuosa, are native only to this area. Wildlife includes 102 mammal species, 49 amphibian, 109 reptilian, 561 bird species and more. Species in danger of extinction include the jaguar, spider monkey and anteater . The Veracruz Reef System is also considered to be a national park and is mostly off the coast of Veracruz city, Boca del Río and Alvarado. The area includes coral reefs, seaweed beds and other marine vegetation, covering an area of 52,239 ha (129,085.4 acres). There are seventeen reefs in total, some of which jut above the surface to form small islands. This system links with the reef systems of Campeche and Yucatán . The history of the native peoples of the state of Veracruz is complex. In the pre-Columbian period, the modern-day state of Veracruz was inhabited primarily by four indigenous cultures. The Huastecs and Otomis occupied the north, while the Totonacs resided in the north-center. The Olmecs, one of the oldest cultures in the Americas, became dominant in the southern part of Veracruz. Remains of these past civilizations can be found in archeological sites such as Pánuco, Castillo de Teayo, El Zapotal, Las Higueras, Quiahuiztlán, El Tajín, Cempoala, Tres Zapotes and San Lorenzo Tenochtitlán . The first major civilization in the territory of the current state was that of the Olmecs. The Olmecs lived in the Coatzacoalcos River region and it became the center of Olmec culture. The main ceremonial center here was San Lorenzo Tenochtitlán. Other major centers in the state include Tres Zapotes in the city of Veracruz and La Venta in Tabasco. The culture reached its height about 2600 years ago, with its best-known artistic expression being the colossal stone heads. These ceremonial sites were the most complex of that early time period. For this reason, many anthropologists consider the Olmec civilization to be the mother culture of the many Mesoamerican cultures that followed it. By 300 BCE, this culture was eclipsed by other emerging civilizations in Mesoamerica. Another major group was the Totonacs, who have survived to the present day. Their region, called Totonacapan, is centered between the Cazones River and the Papaloapan River in the north of the state. Pre-Columbian Totonacs lived from hunting, fishing and agriculture, mostly of corn, beans, chili peppers and squash. This is also the native region of the vanilla bean. Clay sculptures with smiling faces are indicative of this culture. The major site is El Tajín, located near Papantla, but the culture reached its apogee in Cempoala (about five miles (8 km) inland from the current port of Veracruz), when it was conquered by the Aztecs. When the Spaniards arrived in 1519, the territory was still home to a population of about 250,000 people living in fifty population centers and speaking four Totonac dialects. 25,000 were living in Cempoala alone. During the 15th and very early 16th century, the Aztecs came to dominate much of the state and dividing it into tributary provinces, of Tochtepec, Cuetlaxtlan, Cempoallan, Quauhtochco, Jalapa, Misantla, and Tlatlauhquitepec. The Aztecs were interested in the area's vegetation and crops such as cedars, fruit, cotton, cacao, corn, beans and vanilla. However, the Totonacs chafed under Aztec rule, with Aztec rulers from Axayacatl to Moctezuma II having to send soldiers to quell rebellions. The Huastecs were subjugated more successfully by the Aztecs and relegated to the provinces of Atlan and Tochpan. Veracruz played an important part in the Spanish conquest of the Aztec Empire by Hernán Cortés and his expedition members. They founded Villa Rica de la Vera Cruz on May 18, 1519, as the first Spanish town in what is now Mexico. By doing so, Cortés threw off the authority of the Governor of Cuba, Diego Veláquez, and took authority from the town council (cabildo) of Veracruz and claim authority directly from the Spanish crown. A small contingent of the expedition remained at Veracruz, while the main body of conquerors moved inland. The Totonacs were the first people with whom the Spanish had contact on the American mainland. The very first contact was with Captain Juan de Grijalva on the coastline north of the present-day city of Veracruz. Still chafing under Aztec rule, Totonac ruler Tlacochcalcatl welcomed Hernán Cortés and promised 50,000 warriors to help defeat Tenochtitlan. The Spanish helped the Totonacs expel Aztec tribute collectors and to seize control of some Aztec outposts. The Spanish founded the port city of Veracruz on the coast, as the first municipality under the direct control of the king of Spain. Cortés then began his march inland to Tenochtitlan. During the Conquest, the rest of the Totonac peoples allied themselves with the Spanish, but the Huastecs, despite also being under Aztec rule, fought against them. After the fall of Tenochtitlan, Cortés sent a regiment to subdue the Huastecs. During the colonial era, Veracruz was the main port of entry for immigrants from Spain, African slaves, and all types of luxury goods for import and export. The first group of Franciscans arrived in Veracruz in 1524, walking barefoot to the capital of the Spanish colony of New Spain. The route between Veracruz and the Spanish capital of Mexico City, built on the site of the Aztec capital Tenochtitlan, was the key trade route during the colonial era. Much of the history of the state is involved with the port city that Cortés founded in 1519. Veracruz became the principal and often only port to export and import goods between the colony of New Spain and Spain itself. To ensure the port's monopoly, it came to have control over almost all of New Spain's Gulf coastline. New Spain's silver and cochineal red dye, were the two most important exports from the port, along with chocolate, vanilla, chili peppers, and much more were exported. Imported were livestock (sheep, cows, goats, horses), wheat and other cultivars. From the Caribbean, slaves, pineapple, and sugar cane were introduced. This made the port a highly prized target for pirates during the colonial period, with attacks and sackings frequent. This led to the building of the fort of San Juan de Ulúa and the fortification of the city overall. Though the Spaniards had halted the Aztec wars and human sacrifices an unexpected problem arose. European diseases[citation needed] decimated the native population of the province, prompting the importation of African slaves during the colonial period, starting in the 16th century. The Spanish imported between 500,000–1,000,000 West African slaves into Mexico between 1535 and 1767 (miscegenation between indigenous and African population began almost immediately). New Spain did not have any laws prohibiting interracial marriage, hence the correct term is Afro-Mestizo, which includes all 3 races: Indigenous, African, and Spanish. Runaway slaves (cimarrones) became problematic to public order since they frequently formed robber bands that attacked travelers on highways. Crown efforts against these groups began in earnest in the late sixteenth century, but a major rebellion broke out in 1606 in the areas of Villa Rica, Nueva Veracruz, Antón Lizardo, and the Rio Blanco area. However, the gravest of these occurred in the Orizaba area, where there were about 500 fugitive slaves. In 1609, a leader named Gaspar Yanga led an insurrection against the Spanish but was defeated in battle. Unrest continued, eventually forcing the government to sign an amnesty pact and giving the Africans the right to form their own community, exacting as a condition that bandits be suppressed. This was called San Lorenzo de Zerral but today it is known as the municipality of Yanga. This was the first time slavery was abolished in the Americas. During the Mexican War of Independence, there was support for the insurgents in many parts of the state, with skirmishes erupting in various parts as early as 1811. A major conspiracy against the colonial government was discovered in the port in 1812, with rebels taking Ayahualulco and Ixhuacán during the same year. This forced royalist troops to withdraw to Xalapa. Eventually, this city along with the port were cut off from Mexico City. Most of the state remained in rebel hands during the rest of the war although the commercial class of the port did not support the effort. In 1821, Juan de O'Donojú, the last viceroy of New Spain, came to the port to leave for Spain. However, until 1823, Spanish troops continued to occupy San Juan de Ulúa Fort. In 1826, the city would receive the first of its four titles of "heroic city" for confronting these remaining Spanish troops. While the last of the Spanish held on in San Juan de Ulúa, Agustín de Iturbide had been declared the emperor of Mexico in 1822. However, his reign quickly encountered resistance from those favoring a republican form of government, including from Antonio López de Santa Anna from his stronghold in Veracruz state. Months later, Iturbide would go into exile and Santa Anna would eventually hold nine terms as president. The French intervened in Mexico through Veracruz for the first time in the 1838, in what became the Pastry War. The port was blockaded. Efforts to defend the country were coordinated from Xalapa. The port was bombarded, but eventually a settlement was reached. During the Mexican–American War, the port was blockaded again, this time by the Americans. Initial American attempts in 1847 to land in Alvarado were checked, but the Americans then made a plan to land a few miles south of Veracruz, which surrendered after a 20-day siege, defeated General Santa Anna's forces at the Battle of Cerro Gordo, and marched inland through Xalapa towards Mexico City, led by General Winfield Scott . Mexico surrendered shortly after. The municipalities of Tuxpan and Chicontepec belonged to Puebla until 1853, when they were annexed to Veracruz to give the state its final form. In 1855, the State Government Palace was constructed. During the Reform War, the major player was Ignacio de la Llave whose name is part of the state's official designation. In 1858, the port became the site for the liberal government under Benito Juárez after he was forced out of Mexico City during the Reform War. Their control of this port and its customs duties allowed liberal forces to gather resources. Conservative forces attacked the state but were repelled from both the port and Xalapa. The Reform War wrecked Mexico's economy and it found itself unable to pay debts it owed to Europe. As a result, Juárez cancelled Mexico's foreign debt. Spain, Britain and France, all outraged by this action, decided in October 1861 to force repayment of their loans by the occupation of the Mexican Gulf Coast. Normally, this move would have been blocked by the United States under the Monroe Doctrine, however, that nation was occupied with a Civil War at the time, and the European powers believed that the Americans could not act. In December, Spanish troops commanded by general Manuel Gasset occupied the port of Veracruz, without any local resistance, followed a month later by French and British forces. The Spanish and the British withdrew after making deals with Juárez, but the French pushed on to establish the reign of Maximilian I of Mexico. However, this was short-lived and the French were expelled through Veracruz in 1866/67. By the end of the century, many infrastructure improvements, such as roads and railways (especially the Ferrocarril Interoceánico) had been completed with the major cities being Veracruz, Orizaba, Xalapa, Córdoba, Jalacingo, Chicontepec and Tantoyuca. The discovery of oil in the north of the state attracted foreign firms, which brought machinery needed for its extraction. These companies included Huasteca Company Petroleum and El Aguila along with American and English firms. During the same time period, uprisings against the government under Porfirio Díaz in the agricultural south of the state were brutally repressed. Unrest against the Díaz regime continued until the outbreak of the Mexican Revolution ousted him from power. The major event leading up to this war in Veracruz was the cigar-makers strike of 1905, when more than 5,000 workers of the "El Valle Nacional" company walked off the job. The governor, Teodora A. Dehesa, unsuccessfully tried to negotiate a settlement. The strike went on for months until the strikers won. This victory encouraged more actions, until strikes at the factories in Rio Blanco, Nogales, Santa Rosa and Contón de Orizaba resulted in dramatic violence in January 1907. No major battles of the Mexican Revolution were fought in the state, though there were skirmishes and attacks on the port. By 1914 rebel Cándido Agular occupied a number of municipalities in the state and in 1917, Venustiano Carranza transferred the federal government here temporarily. On April 21, 1914 an incident involving U.S. sailors in Tampico led President Woodrow Wilson to land American troops in Veracruz, where they remained for six months. Mexico later responded by severing diplomatic relations. After the Revolution, agrarian reform, including the redistribution of land and the creation of ejidos took place here. The oil companies in the north of the state were nationalized and consolidated into PEMEX in the 1930s by Lázaro Cárdenas. In the 1950s, more road construction, such as the Mexico City- Poza Rica, Veracruz-Alvarado- Coatzacoalco and Tinajas-Ciudad Aleman-Tlacoatalpan highways were constructed. The Universidad Veracruzana was expanded as well. In 1960, the Museum of Anthropology in Xalapa was inaugurated as well as the Coatzacoalco-Salina Cruz highway. The Veracruz city international airport was opened in the 1970s. In the ten years after 2006, at least 3,600 people have disappeared within the state. Multiple mass graves have been found within the state. This is seen as part of the over 28,000 missing individuals related to the Mexican Drug War. Within the state the Gulf Cartel and Los Zetas have battled for control. Additionally, this has led to journalists being targeted and killed within the state. Veracruz has one of Mexico's leading economies, based on agriculture and petroleum. Using relatively recent night light data and electricity consumption in comparison with Gross County Product, the informal sector of the local economy in Veracruz state is shown to have grown during the period of the Fox Administration though the regional government remained PRI. The assumption that the informal economy of Mexico is a constant 30% of total economic activity is not supported at the local level. The small amount of local spatial autocorrelation that was found suggests a few clusters of high and low literacy rates amongst municipios in Veracruz but not enough to warrant including an I-statistic as a regressor. Global spatial autocorrelation is found especially literacy at the macro-regional level which is an area for further research beyond this study. Improved literacy bolsters both the informal and formal economies in Veracruz indicating policies designed to further literacy are vital for growing the regional economy. While indigenous people are relatively poor, little evidence was found that the informal economy is a higher percentage of total economic activity in a municipio with a high share of indigenous people. While the formal economy might have been expanding relative to the informal economy in 2000, by 2006 this process had been reversed with growing informality. While rural municipios have smaller economies, they are not different than urban municipios in the share of the economy that is informal. Programs in the past that might move economic activity from the informal to the formal sector have not succeeded suggesting public finance issues such as tax evasion will continue to plague the state with low government revenues. The state grows half of the country's citrus fruit and grows the most kinds. This occupies 180,577 hectares and produces 2,575,140 tons annually. Varieties include oranges, tangerines, mandarins, limes and grapefruit. Most citrus is grown in the north of the state, and much of the lime crop is exported, supporting a packing and shipping industry. Veracruz is the largest mango producer in the country, grown on 31,640 hectares producing 287,000 tons. Most of this is the manila variety, which is preferred in Mexico. 95% of this crop is consumed fresh within Mexico although exports to Canada have begun. [citation needed] Vanilla beans are native to the state, which is the primary producer for Mexico. Most of this crop is grown in an area known as Totonacapan in and around Papantla. From the tropical forests of the inland regions come dyewoods, hardwoods, and rubber. About 20% of the state's territory is forested, with 220,000 of temperate forest and 1,200,000 hectares of tropical forests. Logging in the state produces 128,254 m3 of wood products per year. The most exploited species include pine, oyamel, cypress and oak. Some tropical hardwoods are harvested as well. Veracruz's long coastline supports a large fishing industry, producing one-fifth of Mexico's catch. Most of the country's mojarra, oysters and shrimp come from here. Other major fish catches include crab, sea bass and red snapper. Veracruz was a pioneer in both the extraction and refining of petroleum products. The state has about one-fourth of Mexico's petroleum reserves and ranks third in petroleum production. Most of this production is concentrated in the northern part of the state. Approximately 40,000,000 barrels (6,400,000 m3) of oil are produced each year and 109,870,000,000 cubic feet (3.111×109 m3) of natural gas. Petrochemicals represent 28.1% of the state's manufacturing and ranks first nationally. There are 22 petrochemical plants, with the most important being La Cangrejera, Jáltipan de Morelos, Poza Rica, Cosoleacaque, Pajaritos and Minatitlán. The "Golden Lane" ("Dos Bocas-Alamo structure" or The Ridge") refers to a series of oil fields aligned in an arc onshore and a symmetrical alignment offshore, forming two sides of a Cretaceous atoll 180 km long. The structure was discovered in 1908 by Weetman Pearson's Mexican Eagle Petroleum Company San diego de la Mar No. 1 well, which flowed 2,500 bbl/day. 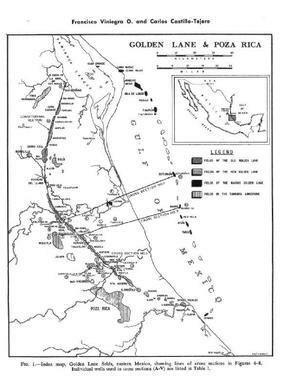 The Golden Lane oil fields penetrate a massive elliptical reef platform, identified as the Sierra del Abra limestone (consisting of reef, backreef and lagoonal facies), which dips southeast. The site for the discovery well was selected due to the presence of petroleum seeps, just as was Edward Laurence Doheny's La Paz No. well in the Ebano-Panuco petroleum district west of Tampico, Tamaulipas, the first Mexican discovery well in 1904. In 1908, the infamous Dos Bocas oil fire occurred after the San Diego de la Mar No. 3 blowout. This was followed by the Potrero del Llano No. 4 well, flowing 100,000 bbl per day during the three months it was out of control. Doheny's Cerro Azul No. 4 well, located by Ezequiel Ordonez, became the largest daily production record holder in 1916 at 260,000 bbl. Geophysical studies, in particular gravimetry, starting in 1920 led to the discovery of the Poza Rica Field in 1932 and Moralillo Field in 1948, on the west flank of the Golden Lane in the Tamabra forereef facies. Refraction seismography surveys started in 1930, augemented in 1948 with reflection seismography, which led to the discovery of the southern extent of the atoll with the Ezequiel Ordonez No. 1 well in 1952 and additional discoveries through 1968. Marine seismic and magnetometer surveys starting in 1957 showed the extent of the atoll offshore and led to the first offshore well, Isla de Lobos No. 1-B, in 1963. The depths of wells are on the order of 500 m onshore and 2000 m offshore. Laguna Verde Nuclear Power Plant (LVNPP) in Alto Lucero, Veracruz, produces about 4.5% of Mexico's electrical energy. Transportation and commerce are important factors in the state, mostly linked to importing and exporting through its four deepwater ports. The focus of most of these activities is the port of Veracruz. It has the most favored position on Mexico's Gulf coast and is extensively used for exports to the United States, Latin America and Europe. Seventy-five percent of all port activity in Mexico takes place in Veracruz. The chief exports of this state are coffee, fresh fruits, fertilizer, sugar, fish and crustaceans. Other ports include those in Tuxpan and Coatzacoalcos. Most highway, rail and air connections link to the port of Veracruz and other ports to the south. The state has 73 companies that have been classified as high-volume exporters and it is ranked sixth in the country for exports. The state contains five major food wholesale markets, 146 government sponsored markets, about 75,000 private stores and 201 supermarkets. Wholesale vendors focus on agricultural products such as wood, livestock and food products. The major focal point for international business is the World Trade Center EXPOVER in Boca del Río. Inaugurated in 1989, the center has facilities to accommodate 5,000 people in 7,000 m2, an exhibition hall of 12,000m2, a business center and parking for over 800 vehicles. The gastronomy of the state is unique in Mexico and mixed Spanish, indigenous, and other influences. From the pre-Hispanic period, the cuisine of the state was unique. The staple triumvirate of corn, beans, and squash was supplemented by tropical fruits, vanilla beans, and an herb called acuyo or hoja santa. Another important native contribution is seafood, which is featured in many dishes such as, arroz a la tumbada and caldo de mariscos (seafood soup). After the conquest and during the colonial period, many other spices and ingredients were brought and have had a greater influence in the cooking here than in other parts of the country. From Europe, the Spanish brought saffron, parsley, thyme, marjoram, bay laurel, and cilantro as well Asian spices such as cloves, cinnamon, and black pepper. The Spaniards also brought wheat, rice, almonds, olives and olive oil, garlic, and capers. The latter three are essential ingredients in what is perhaps the most famous specialty of the region, huachinango a la veracruzana, red snapper in a spicy tomato sauce. Caribbean imports such as sugar cane and pineapple were adapted as well as the peanut, brought from Africa by the Portuguese (although the peanut is originally from South America). Veracruz cuisine divides into six regions called Sotavento, Centro Norte, Centro Sur, Sierra, Costa Norte, and Los Tuxtlas. The Sotovento area is in the south of the state, and the dishes here are heavily based on rice. Common dishes include arroz a la tumbada, which is rice cooked with seafood or meat and rice with fried bananas. Seafood dishes are also prominent based mostly on fish and shrimp. A common ingredient in dishes is a herb called “hoja santa” or “hierba Santa,” which is a plant of the Piperaceae family. The Centro Norte is centered on Xalapa. Dishes here tend to be more indigenous in nature, heavily flavored with mild chili peppers. Common dishes here include Chilehuates, similar to a tamale, stuffed chile peppers, and enchiladas. Less seafood and more pork and domestic fowl are consumed. The Centro Sur area is mostly indigenous and encompasses the area of, Huatusco, Coscomatepec, Cotaxtla, Orizaba, Amatlán, Huilango y las españolas Córdoba y Fortín de las Flores, la negra Yanga and San Lorenzo de los Negros. Dishes here are similar to Centro Norte, but chayotes appear more often as this region is a major producer of the vegetable. Meats in adobo sauce are common as well. The Sierra and Costa Norte encompass the northern part of the state, such as the Pánuco River area and Totonacapan. This area is noted for a number of unique dishes such as frijoles en achuchutl, made with black beans, pork rind, chayotes, squash seeds, and jalapeño peppers. Bocoles are a kind of filled tortilla made with corn dough, stuffed with black beans, chorizo, eggs, or seafood, which then are fried in lard. Tamales are often made with banana leaves. The area is also known for its breads, especially anise–flavored rolls. The Los Tuxtlas area is centered on the communities of Santiago, San Andrés and Catemaco, which were the center of the Olmec civilization. The cuisine in this area features yucca, “chocos” (a type edible flower), fish, especially mojarra, and exotic meats such as monkey, and iguana. The state capital of Xalapa is also home to a number of important museums. The Museum of Anthropology contains the second most important collection of Mesoamerican artifacts in the country. It was built beginning in 1959 over six hectares. The complex is divided into various halls and galleries by theme, focusing on the Olmec and Totonac cultures. The Patio Olmeca contains the colossal head found in 1945 and known as El Rey (The King). Other important artifacts include giant stelae and San Martin Pajapan Monument 1 (at right). The Museum of Science and Technology is in Xalapa. It contains more than 400 exhibitions in eight halls: Life, Ecology, Space, Transportation, Sciences, Energy, Water and Earth. The Pinoteca Diega Rivera was established by the state in the former Monastery of San Francisco in Xalapa. Its primary function is to preserve and display Rivera’s works owned by the state, but it also contains early works by José María Velasco, Jorge Cuesta and Teodoro A. Dehesa. Near the city is the Hacienda del Lencero, which was the home and headquarters of President Antonio López de Santa Anna in the 19th century. It has been preserved and turned into a museum. In Tuxpan is the Regional Museum of Anthropology with more than 400 pieces from pre-Hispanic groups in the region, displayed in four halls. Most of the pieces come from the center of the state and from the Huasteca region.On the edge of the Tuxpan River.The city also has the Mexican-Cuban Museum. It contains a collection of photographs from the Cuban Revolution as well as a statue of José Martí . Other museums are scattered in other parts of the state. The Salvador Ferrando Museum is located in Tlacotalpan and contains many everyday items and art from the 16th to the 19th centuries.The Tuxteco Regional Museum in Santiago de Tuxtla contains Olmec and Totonac artifacts including art objects, farming implements, utensils and more. In the garden area, there are giant stone sculptures from the Tres Zapotes site. The Jardín Central (Central Garden) of the municipality of Tierra Blanca has a number of Totonac archeological pieces on display. The Archeological Museum of Córdoba is in the city of the same name with three exhibition halls containing artifacts from the Maya, Olmec, Toltec and Huastec cultures. There is also a collection of historical photographs of the city. The Veracruz State Art Museum (Museo de Arte del Estado de Veracruz) is located in Orizaba in what was the monastery associated with the Concordia Church. Its collection includes works by Diego Rivera, Ignacio Rosas and Gonzalo Argüelles. It also contains a collection of historical photographs related to Veracruz and art. The Malintzin Archeological Museum is in the municipality of Nogales. It is a small museum with one hall, with photographs and documents. It is located in the church where Malinche and Juan de Jaramillo were supposedly married. The state is noted for its quantity and variety of festivals. The most important of these is Carnival in the city of Veracruz. This city's version of the event begins with the “burning of bad humor,” which is represented in effigy. A number of kings and queens are "crowned" including categories for children but the most important is the Rey Feo (Ugly King) and the Reina del Carnaval (Queen of the Carnival). The latter is accompanies by cadets from the Naval Academy during the parade. This celebration is repeated all along the Veracruz coastline with other significant festivities taking place in Alvarado, Coatzacoalcos, San Rafael and Villa José Cardel. Minatitlán's celebration draws people from the nearby states of Oaxaca and Tabasco. Day of the Dead is celebrated in almost all of Mexico from 31 Oct to 2 November but there are local twists in the state. In some places, it is commemorated during the months of August and September. In Papantla, boards or tables are placed on rooftops, which have been adorned with flowers, plant matter and more. In Tantoyuca, it is commemorated with costumes and music, similar to Carnival. The Christian celebration of Candlemas is fused with traditions associated with Chalchiuhtlicua, the goddess of water, rivers, lakes and ocean. She was replaced by the Virgin of Candlemas, the protector of fishermen, making this celebration particularly important on the coast, especially in Tlacotalpan, where it is celebrated with much pomp. In Jáltipan de Morelos, ethnic Nahuas and Popolucas dress in elaborate costumes and arrange their hair in intricate styles. In Santa María Magdalena, on 22 July, bulls are set free to roam the streets. Corn harvest festivals are prominent in the Huasteca region in municipalities such as Chontla, Chicontepec, and Ixhuatlán de Madero. These generally include native dances and foods based on corn. However, the state's most famous dance is as much a ritual and daredevil act as movements performed to music. The Danza de los Voladores (Dance of the Flyers) is a ceremony/ritual which has its roots in the pre-Hispanic period and presently best known as associated with the town of Papantla, Veracruz. It is believed to have originated with the Nahua, Huastec and Otomi peoples in central Mexico, and then spread throughout most of Mesoamerica. The ritual consists of dance and the climbing of a 30-meter pole from which four of the five participants then launch themselves tied with ropes to descend to the ground. The fifth remains on top of the pole, dancing and playing a flute and drum. According to myth, the ritual was created to ask the gods to end a severe drought. Although the ritual did not originate with the Totonac people, today it is most strongly associated with them, especially those in and around Papantla, as the ceremony has died off in most other places. The ceremony was named an Intangible Cultural Heritage by UNESCO in order to help the ritual survive and thrive in the modern world. The state's best-known musical style is called the "son". A “son” is a musical variation which traces its origins to Spain and developed during the 17th and 18th centuries. It is the state's most popular musical style shows influences from the many peoples who have lived here such as indigenous groups, Portuguese, Italians, Africans, French and others. The music is generally performed by harps, violins and guitars, with an occasional wind instrument. Son huasteco (also called son huapango) is a variety of son played in the north of the state mostly among the Totonacs. Son jarocho is the better known and more popular variety played in the south of the state. The famous Grammy award-winning song "La Bamba" by Los Lobos is said have its roots in a traditional folk song from Veracruz (hence the reference to the "Marinero" in that song). The state has produced a number of musicians famous in the country. One of the best known is Francisco Gabilondo Soler. Gabilondo Soler is best known for creating a character known as “Cri-cri”, a singing cricket for a radio show in the first half of the 20th century. As a musician, he specialized in writing children's songs such as "Abuelito", "Caminito de la escuela", "El baile de los muñecos", "El burrito" and "La negrita Cucurumbé". A number of his works have been translated into other languages. Another famous musician is Agustín Lara, who has had more international fame. Nicknamed "Flaco de oro" (golden skinny one), he always insisted that he was born in Tlacotalpan, Veracruz and not Mexico City as records show. Lara formed his first band in 1930 called El Son de Marabú and toured almost continuously in Mexico and abroad during his career. His most famous compositions include "Veracruz", "Noche de Ronda" and "Solamente una vez". Other prominent musicians include Toña "La Negra" or María Antonia del Carmen Peregino, Narcisco Serradel, Lorenzo Barcelata and María Greever. During the colonial era, a movement called the “estilo veracruzano” (Veracruz style) developed mostly focusing on landscapes in the state with a certain amount of indigenous influence although the painters themselves were criollo or Mexico-born Spanish. These paintings focus on the mountains, valles, coasts, volcanos and other natural phenomena in the state. Most of the proponents of this were born in Veracruz itself and include José Justo Montiel (1824–1899), Gonzalo Argüelles Bringas (1877–1942), Eugenio Landecio (teacher of José María Velasco), Natal Pesado and Ignacio Rosas. However, most of Veracruz's best-known artists are from the 19th and 20th centuries. In the 19th century, these include Miguel Mata Reyes, Salvador Ferrando, José María Jara, Enrique Guerra and Alberto Fuster. Miguel Mata Reyes is best known for his contributions to the design of the Palacio de Bellas Artes as well a portrait of Antonio López de Santa Anna. Salvador Ferrando was a portrait and landscape artist from the north of the state. Until recently, most of his work had been hidden in a museum named after him in the Tlacotalpan region. Much of it now is on display at the Museo de Arte de Veracruz in Orizaba. José María Jara is noted for his paintings of Veracruz customs, whose works include El Velorio, which was presented at the World's Fair in Paris. Enrique Guerra was an important sculptor at the end of the 19th century. His best-known works are bas reliefs and include Asesinato de César, Coroliano, Thais and Crisálida. Alberto Fuster was most active at the end of the century and is noted for bringing symbolism painting to Mexico from his stay in Europe. His works include El progreso, Safo en el templo de Delfos and Nativa con loro. There are three important artists from the 20th century, Carlos Bracho, Norberto Martínez and Teodoro Cano García. Active in the first half of the century, sculptor Carlos Bracho's work has been compared to that of Juan Rulfo. His works have been done in plaster, bronze, terracotta and green onyx and include monumental works which can be found in the cities of Xalapa, Puebla, Pachuca and Mexico City. His best-known works are El abrazo, Cabeza verde and El campesino se apodera de la tierra. Norberto Martínez only lived 45 years but is considered one of the most prolific of Mexican painters who dedicated most of his works to social themes. A number of these are early murals such as El comercio in the Jáuregi de Xalapa market as well as an untitled work in a private home in Córdoba which deals with the fusion of the Spanish, indigenous and African races in Mexico. Later works include the three murals in the main stairwell of the School of Law at the University of Xalapa and El hombre y el conocimiento at the Universidad Veracruzana. Teodoro Cano García is one of Mexico's most famous muralists of the late 20th century, famous for the promotion of the Totonac culture of his hometown of Papantla. He has created paintings, sculptures, etchings, photography and mixed media works with his murals and sculptures most acclaimed. Examples of his work can be seen in various parts of public buildings in Papantla. Most of Veracruz's older architecture can be found in the inland cities of Xalapa and Córdoba. Despite being the first Spanish settlement, the city of Veracruz lost most its older structures to the various invasions it has suffered. Architecture from the 16th to the 19th century includes colonial Spanish, Moorish, Neo gothic and Neoclassical. From the 20th century on, a number of names stand out. Armando Bravo Ramírez remodeled the State Government Palace and the facade of the Capillas de Ánimas, both in Xalapa. Other prominent names responsible for many projects in the state include Luis González Aparicio, Bernal Lascuraín Rangel and Luis Manuel Tello Deschamps. The literary arts reached their peak in Veracruz starting in the 19th century and extends to the “Generation of the 1950s.” Salvador Díaz Mirón is one of Veracruz's most-distinguished poets. Over his lifetime from the latter 19th to early 20th centuries, he worked as a professor, politician and journalist contributing to periodicals such as El Veracruzano, El Orden, and El Imparcial. His creative works include some of the first Romantic pieces produced in Mexico such as Oda a Víctor Hugo, Ojos verdes, Gloria and Voces interiores. Other works include Poesías A Tirsa, Nox (also known as Claudia) and his last works such as Al buen cura and La mujer de nieve. He became a member of the Academia Mexicana de la Lengua and is buried at the Rotonda de los Hombres Ilustres in Mexico City. María Enriqueta Camarillo was one of a number of women writers to gain prominence in Mexico at the end of the 19th century. While she wrote a number of works such as Jirón del mundo, Sorpresas de la vida and El Secreto, she is best known for Rosas de la infancia, with which many Mexicans learned to read. Writers born at the end of the 19th century, such as Gregorio López y Fuentes, Manuel Maples Arce and Jorge Mateo Cuesta Porte-Petit were often concerned with social issues. Works of this type include El Indio by López, Metrópolis by Maples and a poem called Canto a un dios mineral by Cuesta. The following generation, born in the first decades of the 20th century, became known as the Generation of the 1950s. During this time Veracruz's literary tradition consolidated and decided to break type. One example is Juan Hernández Ramírez’s writing of poetry in the Nahuatl spoken in the La Huasteca area of Veracruz. One important name from this generation is Emilio Carballido who wrote about 100 plays as well as scripts for radio and television. Some of his works include Rosalba y los llaveros, Felicidad and Las visitaciones del Diablo. In 1996, he won the Premio Nacional de Literatura and in 2002 he received the Ariel de Oro for his work in cinema. The patron saint of Veracruz is Rafael Guízar y Valencia. Public education in the state is supervised by the state Dirección General de Educación Popular and the Dirección General de Educación Media Superior y Superior. The current system is the result of a number of reforms which took place in the 1980s and 1990s. In the late 1990s, 302 new school campuses were created statewide and 257 schools were remodeled. These included new schools for special education, distance learning and technological institutes, giving the state one of the highest number of school campuses in the country. There are a total of 20,479 schools, with nearly 2 million students and about 85,000 teachers. 93% of schools are in the basic education category (preschool, primary and middle schools. Preschools also include those geared towards the indigenous populations, focusing on bilingual and bicultural education in both the indigenous language/culture and Spanish. One major focus of these and other schools is to eliminate illiteracy in indigenous communities. The "Medio Superior" level includes vocational high school and technical colleges. These account for 6.6% of schools in the public system. The Superior level includes teachers’ colleges and universities. There are 166 institutes at this level, with about 68,000 students studying 221 different majors. There are also 63 master's degree programs and six PhDs. These institutions serve about 135,000 students accounting for about 19% of the college-aged population (19- to 24-year-olds), slightly below the national average of 24%. The major state university is the Universidad Veracruzana, with offers 56 bachelor's degrees, 37 masters and 5 PhDs. It is based in the capital of Xalapa and is noted for its large and varied sports programs. There are campuses in fourteen other cities. About 37% of university students attend the main public university, with a student population of 47,000 undergraduates and 2,000 postgraduates. Other important schools include Instituto Tecnologico de Veracruz in Veracruz, Universidad Anáhuac in Xalapa, Universidad de Xalapa in Xalapa, ITESM in Córdoba, Universidad Cristóbal Colón in Veracruz, the Veracruz Naval Academy and the Instituto Tecnológico del Mar. The number of ethnic communities in the state has been calculated at 2,062. The most numerous include the Nahuas, Totonacs, Huastecs, Popolucs, Zapotecas, Chinantecas, Otomis, Mazatecas, Tepehuas, Mixtecas, Zoques, Mixes, Mayas and Tzotzils, all indigenous groups. The largest are Nahuas, who make up over half of the indigenous population. Most native communities can be found in 68 municipalities especially in Tehuipango, Mixtla de Altamirano, Astacinga, Soledad Atzompa, Atlahuilco, Tequila, Tlaquilpan, Los Reyes, Magdalena, San Andres Tenejapan, Tantoyuca, Zongolica, Chicontepec, Papantla, Ixhuatlán de Madero, Soteapan, Playa Vicente, Mecayapan y Coyutla, Benito Juárez, Coxquihi, Espinal, Filomeno Mata, Ixcatepec, Mecatlán and Zozocolco de Hidalgo. In 1998, about 10% of the population spoke an indigenous language; however, this does not take into account all indigenous peoples. The census of 2005 counted 605,135 as speaking an indigenous language. There are also small immigrant communities of Spaniards, Italians, Basque and Lebanese. African slaves were imported to Mexico through the Veracruz port. At one point, they outnumbered Europeans and a significant number ran away from haciendas and plantations to form their own communities, sometimes allied with indigenous groups. One such rebellion was led by Yanga, who successfully negotiated a free African community with Spanish authorities in 1609. Like other groups, many of African descent would intermarry with other groups, with the category of “mulatto” existing in the old colonial caste system for those with African blood. Today, the vast majority of Afro Mexicans in Veracruz and other parts of the country are spread out and intermixed with the rest of the population. With a population of 7,110,214 (2005), Veracruz is the third most populous entity in the country, after the Federal District of Mexico City and the State of Mexico. Population growth has slowed in the state in the last decades, due to lower birthrates and the exodus of migrants, mostly men. Women outnumber men. One reason for the decline in birthrates is the elevation of education levels, especially among women. Another is urbanization, with about one-third of the state's population living in urban centers, especially Veracruz, Xalapa, Coatzacoalcos, Minatitlán and Papantla. Most (90%) of the state's communities, outside of municipal seats have fewer than 500 people and contain only 21% of the total population. The migration of men outside the state has put more women into the state's workforce. Approximately 75% of the population is under 45 years of age and 30% under the age of 15. Tourism mostly centers on the port city of Veracruz but there are other destinations. There are over 1,000 hotels in the state, over half of which are small, family-owned enterprises. Almost all of the four and five-star establishments are in metropolitan area of Veracruz. Many of the state major historical and cultural monuments are located in the port of Veracruz. Some of these include the Aquarium, the Museum of the City (Museo de la Ciudad), The Agustín Lara Museum, the Santiago Fortress (Baluarte de Santiago) the "Las Atarazanas" Museum and the San Juan de Ulúa Fort. To the north of the port city is the Sierra or Totonacalpan area of the state, home to the Totonac people. This is home to the important pre-Hispanic city of El Tajín and the present-day city of Papantla. The modern city is best known as the home of the Totonac version of the “danza de voladores”; there, the dancers spin from 80 ft (24.4 m) high poles. The area is also the native habitat of the vanilla bean. To the south of the port is on the coast, is Catemaco. This is in a tropical area. The area's two main features are Lake Catemaco, which is located in the crater of an extinct volcano and Isla Tanaxpillo just off the coast. This island is also called the island of the monkeys or baboons due to a group of feral monkeys that escaped and found refuge here. The largest and most important site is El Tajín, located near the city of Papantla. The name is from the Totonac language and means “thunder,” but no one knows what the true name of this city was. It is also unknown if the Totonac built it, but since they have dominated the region for centuries, they lay claim to it.The city developed from the end of the Classic period and the beginning of the Post Classic period, between 800 and 1150 C.E. It is divided into five zones, the Plaza del Arroyo Group, the Central Zone, the Gran Xicalcoliuhqui, Tajín Chico and the Column Complex. Its signature building is the Pyramid of the Niches, named after the 365 niches built into the levels of the structure. The site has a large number of Mesoamerican ball game courts, one with details reliefs showing the beheading of a ballplayer and his role in the afterlife. The Tres Zapotes site is located the community of the same name. Covering 1.5 hectares, the main building has a square base, which is surrounded by gardens and trees. The most important find from his is Stele “C” which is on display at the Museo Nacional de Antropología in Mexico City. El Pital is a site in the municipality of Martínez de la Torre. It consists of a mound with a pyramid base and stairs on the east side.The site's culture is considered to be a link between the coastal and highland cultures of the region. The Centro Ceremonial Cuajilote is located on the Bobos River. It consists of a large plaza 400 meters long lined with structures. In the center of the plaza there are three shrines, one of which contains phallic figures. Veracruz became a state in 1824. Its government is headed by a governor, who is elected to a single term of six years. Members of the unicameral legislature, the State Congress, are elected to three-year terms. The state is divided into 212 local governmental units called municipios (municipalities), each of which is headquartered in a prominent city, town, or village. The newest of these are the municipalities of San Rafael and Santiago Sochiapan which were created in 2003. These municipalities are grouped into regions called Huasteca Alta (with ten municipalities), Huasteca Baja (with 23 municipalities), Totonac (with 15 municipalities), Nautla (with 11 municipalities), Capital (with 33 municipalities), Sotavento (with 12 municipalities), De las Montañas (with 57 municipalities), Papaloapan (with 22 municipalities), De los Tuxtlas (with four municipalities) and Olmeca (with 25 municipalities) . According to many journalists' organizations, Veracruz is one of the most dangerous places for journalists especially after governor Javier Duarte de Ochoa came to power in December 2010. The state contains 1,675.3 km (1,041.0 mi) of railway. Most of this is conceded by the federal government to private companies, with strategic stretches maintained directly by the government. Some of the private companies include Kansas City Southern de México and Ferrosur. These lines are used almost exclusively for the transportation of freight, which in 1999 added up to 37 million tons. Three rail lines serve the port of Veracruz exclusively. One is dedicated to the port of Coatzacalcos. The ports of Veracruz are Tuxpan, Veracruz, Coatzacoalcos, Pajaritos, Minatitlán-Nanchital, Tecolutla, Nautla, Alvarado and Tlacotalpan. The first three are the ports for heavy cargo ships, with Veracruz the most important of the three. The others are small ports for small ships, fishing boats and tourism. All ports are operated privately with the exception of Pajaritos, which is operated by PEMEX. Port traffic in Veracruz account for 10% of all commercial traffic in the country, 23.4% of the port traffic of Mexico and 21% of all port traffic in the Gulf of Mexico and Caribbean. Goods imported through the state reach 16 out of Mexico's 31 states plus Mexico City. The port of Veracruz alone handles over 12 million tons of freight per year. Coatzacoalcos is important for its handling of petroleum products. The state contains three major airports. “El Tajín” in Tihuatlán serving Poza Rica and “Canticas” in Minatitlán provide national service. “Heriberto Jara Corona” in the city of Veracruz provides national and international service. There are also 31 smaller regional airfields in municipalities such as Acayucán, Cazones de Herrera, Córdoba, Cuitlahuac, Juán Rodríguez Clara, Ozuluama, Platón Sánchez, Playa Vicente, Soconusco, Tamalín, Tamiahua, Tecolutla, Temapache, Tempoal and Tierra Blanca. ^ "Las Diputaciones Provinciales" (PDF) (in Spanish). p. 15. ^ Nettie Lee Benson; Colegio de México. Centro de Estudios Históricos; Universidad Nacional Autónoma de México (1994). La diputación provincial y el federalismo mexicano. UNAM. pp. 227–. ISBN 978-968-12-0586-7. Retrieved 20 February 2011. ^ "Senadores por Veracruz LXI Legislatura". Senado de la Republica. Retrieved April 9, 2010. ^ "Listado de Diputados por Grupo Parlamentario del Estado de Veracruz". Camara de Diputados. Retrieved April 9, 2010. ^ "Relieve". Cuentame INEGI. Archived from the original on June 17, 2010. Retrieved October 20, 2010. ^ "Encuesta Intercensal 2015" (PDF). Retrieved December 9, 2015. ^ "Mexico en Cifras". INEGI. Archived from the original on April 20, 2011. Retrieved April 9, 2011. ^ "Reporte: Jueves 3 de Junio del 2010. Cierre del peso mexicano". Pesomexicano.com.mx. Retrieved August 10, 2010. ^ "Nomenclatura" [Nomenclature]. Enciclopedia de los Municipios de México Veracruz de Ignacio de la Llave (in Spanish). Mexico: Instituto Nacional para el Federalismo y el Desarrollo Municipal. 2005. Archived from the original on June 16, 2011. Retrieved August 3, 2010. ^ a b c d e f g Hursh Graber, Karen (January 1, 2006). "The cuisine of Veracruz: a tasty blend of cultures". Mexconnect. Retrieved August 3, 2010. ^ a b c "Estado de Veracruz" [State of Veracruz] (in Spanish). Veracruz: Secretaria de Desarrollo Economico y Portuario. 2006. Retrieved August 3, 2010. ^ a b c d e f g h i j k l m n "Medio Fisico" [Environment]. Enciclopedia de los Municipios de México Veracruz de Ignacio de la Llave (in Spanish). Mexico: Instituto Nacional para el Federalismo y el Desarrollo Municipal. 2005. Archived from the original on June 16, 2011. Retrieved August 3, 2010. ^ a b c d e f g h i j "Veracruz". Encyclopædia. Retrieved August 3, 2010. ^ a b c d e f g h i j k l m n o p q r s t u v w x y z aa ab Schmal, John P. (2004). "The History of Veracruz". Houston Institute for Culture. Retrieved August 3, 2010. ^ "En el estado de Veracruz, los dos ríos más contaminados de México: Salvemos el Agua" [In the state of Veracruz, the two most contaminated rivers in Mexico: Lets sabe the water]. Potamología (in Spanish). Mexico: Instituto Mexicano de Tecnología del Agua. January 1, 2010. Retrieved August 3, 2010. ^ a b c d "Veracruz moist forests". Terrestrial Ecoregions. World Wildlife Fund. Retrieved August 3, 2010. ^ a b c d e f g h i j k l m n o p q r s t u v "Historia" [History]. Enciclopedia de los Municipios de México Veracruz de Ignacio de la Llave (in Spanish). Mexico: Instituto Nacional para el Federalismo y el Desarrollo Municipal. 2005. Archived from the original on June 16, 2011. Retrieved August 3, 2010. ^ Ida Altman, Sarah Cline, and Javier Pescador, The Early History of Greater Mexico. Prentice Hall 2003, p. 57. ^ Peter Gerhard, A Guide to the Historical Geography of New Spain, Revised Edition. Norman: University of Oklahoma Press 1993. ^ Altman, et al. The Early History of Greater Mexico, p. 119. ^ "Mexico finds 166 bodies in mass grave". France24. 7 September 2018. Retrieved 6 September 2018. Woody, Christopher (11 June 2018). "A former Mexican governor has been accused of involvement in forced disappearances, and it points to a sinister problem with Mexico's police". Business Insider. Retrieved 6 September 2018. ^ José de Córdoba (15 March 2017). "Grieving Mothers Lead Authorities to Mass Grave in Mexico". Wall Street Journal. Retrieved 6 September 2018. Garrido, Edgar (19 March 2017). Cameron-Moore, Simon, ed. "Mexico drug war investigators unearth 47 more skulls in mass graves". Retrieved 6 September 2018. ^ Wade, Lizzie (14 December 2016). "How forensic anthropologists are helping the families of Mexico's disappeared seek justice". Science. Retrieved 6 September 2018. ^ "Mexico drugs war: Mass grave found in Veracruz". BBC News. 19 June 2014. Retrieved 6 September 2018. ^ Imison, Paul (17 August 2015). "How Veracruz Became the Most Dangerous State in Mexico for Journalists". Vice. Retrieved 6 September 2018. ^ Brock, Gregory; Jie Tan; Robert Yarbrough (2014). ""The Informal Economy of Veracruz State during the Fox Administration"". Journal of Developing Areas. 48: 153–168. ^ Moritzky, Charles E. (January 1, 2006). "Veracruz: traveling the Central High Plains of Mexico". Mexconnect. Retrieved August 3, 2010. ^ Viniegra O., F., and Castillo-Tejero, C., 1970, Golden Lane Fields, Veracruz, Mexico, in Geology of Giant Petroleum Fields, AAPG Memoir 14, Halbouty, M.T. editor, Tulsa: American Association of Petroleum Geologists, p. 310. ^ a b Viniegra O., L., and Castillo-Tejero, C.,Golden Lane Fields, Veracruz, Mexico, in Geology of Giant Petroleum Fields, Tulsa: American Association of Petroleum Geologists, Memoir 14, p. 309, 1970. ^ Viniegra O., L., and Castillo-Tejero, C.,Golden Lane Fields, Veracruz, mexico, in Geology of Giant Petroleum Fields, Tulsa: American Association of Petroleum Geologists, Memoir 14, pp. 314 and 316, 1970. ^ Viniegra O., L., and Castillo-Tejero, C.,Golden Lane Fields, Veracruz, Mexico, in Geology of Giant Petroleum Fields, Tulsa: American Association of Petroleum Geologists, Memoir 14, pp. 309-311, 1970. ^ a b c Viniegra O., L., and Castillo-Tejero, C.,Golden Lane Fields, Veracruz, Mexico, in Geology of Giant Petroleum Fields, Tulsa: American Association of Petroleum Geologists, Memoir 14, p. 311, 1970. ^ Viniegra O., L., and Castillo-Tejero, C.,Golden Lane Fields, Veracruz, Mexico, in Geology of Giant Petroleum Fields, Tulsa: American Association of Petroleum Geologists, Memoir 14, pp. 311 and 317, 1970. ^ a b Viniegra O., L., and Castillo-Tejero, C.,Golden Lane Fields, Veracruz, mexico, in Geology of Giant Petroleum Fields, Tulsa: American Association of Petroleum Geologists, Memoir 14, p. 312, 1970. ^ Viniegra O., L., and Castillo-Tejero, C.,Golden Lane Fields, Veracruz, Mexico, in Geology of Giant Petroleum Fields, Tulsa: American Association of Petroleum Geologists, Memoir 14, pp. 311-312, 1970. ^ Brock, Gregory (2014). ""The Long Run Industrial Growth of Veracruz State, 1955-2008". Journal of Economic Studies. 41: 821–832. ^ a b c d e f g h i j k l m n o p q r s t u v w x "Atractivos Culturales y Turísticos" [Cultural and Tourist Attractions]. Enciclopedia de los Municipios de México Veracruz de Ignacio de la Llave (in Spanish). Mexico: Instituto Nacional para el Federalismo y el Desarrollo Municipal. 2005. Archived from the original on June 16, 2011. Retrieved August 3, 2010. ^ Wilkerson, S. Jeffrey K (1987). El Tajin: A Guide for Visitors. pp. 75–76. ISBN 968-499-293-9. ^ "'Flying Men' are now Cultural Heritage". McClatchy – Tribune Business News. Washington, DC. 2009-10-01. ^ a b c d e f g h "Infraestructura" [Infrastructure]. Enciclopedia de los Municipios de México Veracruz de Ignacio de la Llave (in Spanish). Mexico: Instituto Nacional para el Federalismo y el Desarrollo Municipal. 2005. Archived from the original on June 16, 2011. Retrieved August 3, 2010. ^ a b "Higher education and research in the State of Veracruz". Organisation for Economic Co-Operation and Development. Retrieved August 3, 2010. ^ "Mexico: extended population list". GeoHive. Archived from the original on March 11, 2012. Retrieved 2011-07-29. ^ "Encuesta Intercensal 2015" (PDF). INEGI. Retrieved 2015-12-09. ^ a b c "Perfil Sociodemografico" [Socio-demographic profile]. Enciclopedia de los Municipios de México Veracruz de Ignacio de la Llave (in Spanish). Mexico: Instituto Nacional para el Federalismo y el Desarrollo Municipal. 2005. Archived from the original on June 16, 2011. Retrieved August 3, 2010. ^ Patrisia Gonzales and Roberto Rodriguez (March 3, 1996). "African Roots Stretch Deep Into Mexico". Mexconnect. Retrieved August 3, 2010. ^ "Veracruz Ignacio de la Llave Número de habitantes" [Veracruz Ignacio de la Llave Number of inhabitants] (in Spanish). Mexico: INEGI. 2005. Retrieved August 3, 2010. ^ "Gobierno" [Government]. Enciclopedia de los Municipios de México Veracruz de Ignacio de la Llave (in Spanish). Mexico: Instituto Nacional para el Federalismo y el Desarrollo Municipal. 2005. Archived from the original on June 16, 2011. Retrieved August 3, 2010. ^ "Regionalización" [Regions]. Enciclopedia de los Municipios de México Veracruz de Ignacio de la Llave (in Spanish). Mexico: Instituto Nacional para el Federalismo y el Desarrollo Municipal. 2005. Archived from the original on June 16, 2011. Retrieved August 3, 2010. ^ "Threats and censorship at peak in Veracruz, Oaxaca, Michoacán and Zacatecas - Reporters without borders". RSF. Retrieved 9 July 2018. Booker, Jackie R. Veracruz Merchants, 1770-1829: A Mercantile Elite in Late Bourbon and Early Independent Mexico. Boulder, Colorado: Westview Press 1993. Carroll, Patrick J. Blacks in Colonial Veracruz. Austin: University of Texas Press 1991. Jiménez González, Victor Manuel, ed. (2010). Veracruz Guia para descubrir los encantos del estado [Veracruz Guide to discover the charms of the state] (in Spanish) (first ed.). Mexico: Editorial Oceano de Mexico SA de CV. ISBN 978-607-400-323-9. Knaut, Andrew L. "Yellow Fever and the Late Colonial Public Health Response in the Port of Veracruz." Hispanic American Historical Review 77:4 (1997) 619-644. Wikimedia Commons has media related to Veracruz.